The most important thing is to regain control of the House in 2018 because we're largely powerless to stop Trump unless and until we do that. SwingLeft is doing great work to that end. Please sign up for Swing Left right now and get involved. 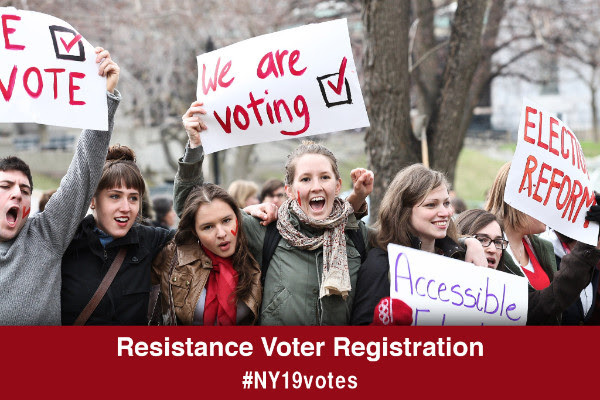 Those of you who are here NY's 19th Congressional District, I cannot urge you strongly enough to start working on registering voters - beginning this Sunday, March 12th. I will be at the Kingston site for the Register Resistance Voters effort this Sunday (thanks for hosting, Citizen Action of NY). Come join me or sign up at one of the many other sites to learn how to register voters, get the materials you need and hit the streets. Bring friends! So even if knocking on doors is not your idea of fun - and trust me, it is not my idea of fun - it is our civic duty. We have to do it.